quien anduvo en mi senda que la siga. I'm an essential part of your existence. I accomplished my humble emulation of Christ. Who pursued my example shall carry on! The line about Christ reminds me of Berlusconi. I guess it must be one of those traditions the Argentinians inherited from the Italians. Hard for some of us to comprehend the impact she had. History is important. I wonder what we could learn from her life. 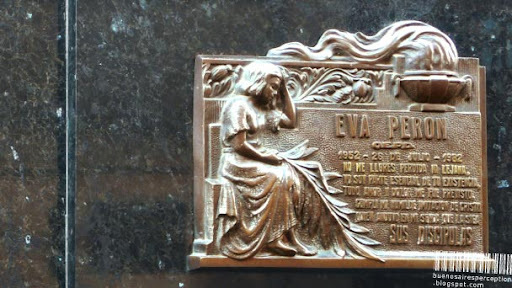 Amazing that Eva has been gone that long already! It would appear that Ms. Peron is still revered in Argentina? Thank you for mentioning this. The tomb is full of other memorials and, to me, they all felt like sincere feelings of the Argentine people. My other favorite tomb in BsAs is Gardel's in Chacarita.